St. Mary campground is the largest campground on the east side of Glacier National Park and is open year round. It is located approximately one half mile west of the park boundary, near the town of St. Mary. Activities such as interpretive programs, book sales, and shuttle service tours are located at the nearby St. Mary Visitor Center. Though shade may be sparse, aspen trees grace St. Mary campground with soothing sounds from spring and summer breezes, and colorful splashes of yellow late in the season. 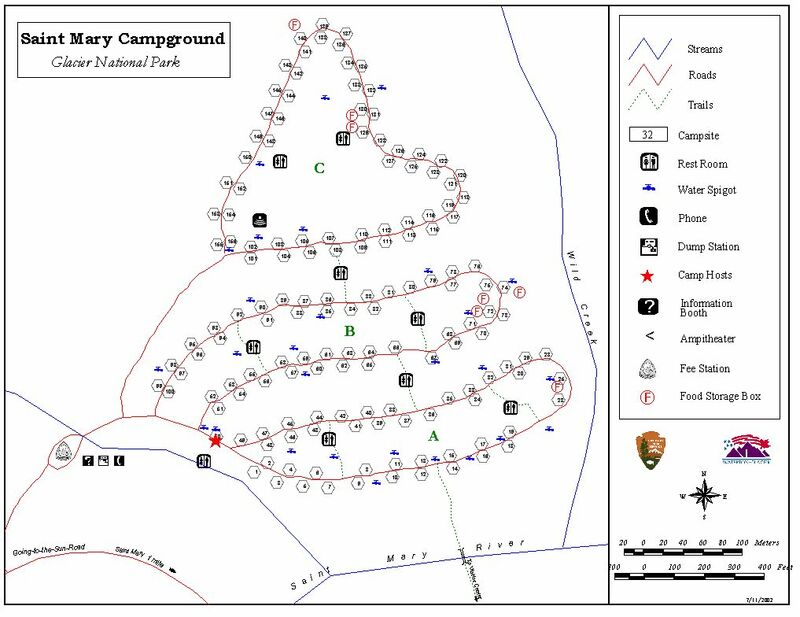 Of the three loops in St. Mary Campground, Loop A is the most sheltered, especially good for tent campers. Loop A is also generator free. Views of Singleshot, East Flattop, and Red Eagle Mountains compliment the landscape, especially in Loop B and C. Potable water is accessible in the campground, and restroom facilities provide flush toilets and sinks with running water. Showers are located in Loop C for registered campers only. Nearby the campground, just outside the park, you will find amenities such as restaurants, gift shops, camp stores, gas, and a grocery store. St. Mary is one of three campgrounds in the park that take reservations. You may sign up through the National Reservation System at http://www.recreation.gov/. Sites can be reserved June 1 through September 1. Individual campsites may be reserved up to 6 months in advance and not less than 3 nights prior. The two group sites can be reserved up to a year in advance. Sites not reserved ahead of time are available on a first come first serve basis. From April 19 to May 23 all sites are first-come first-served and the Fee is $10/night. From May 24 to May 30 all sites are first-come first-served and the fee is $20/night. From May 31 to September 1 the campround is operated as part of the National Recreation Reservation System and the fee is $23/night. From September 2 to September 15 all sites are first-come first-served and the fee is $20/night. From September 16 to October 31 all sites are first-come first-served and the Fee is $10/night. From November 1 to April 18 all sites are free and the campground is in primitive status with no running water. Campers should bring their own water.